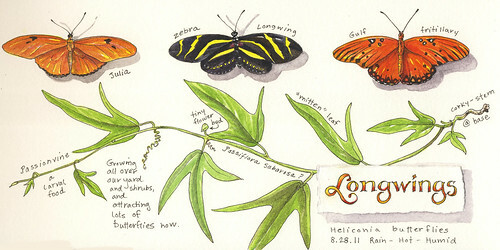 Longwing butterflies, originally uploaded by Elizabeth Smith. This month I've noticed many small passionvines thriving: climbing up shrubs and sprawling over the ground. These passionvines have an undistinguished small flower, and bear small purple fruits. I'm sure that some are the native corky-stemmed passionvine because of the mottled brown and corky base of the vine. Others I'm not so sure of – partly because the leaves are so variable, and the corky-stemmed version doesn't always have a corky stem when it’s young. I see some with three-lobed skinny leaves, some with fat lobes, and then there are the plants suddenly sporting “mitten” leaves. One plant has no lobes at all, just a pleasant oval leaf shape. 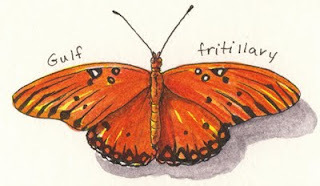 They all attract these three butterflies, the Julia, Gulf Fritillary, and Zebra longwing. The attraction is a chemical that renders the caterpillar (and butterfly) distasteful to predators. So the butterflies identify this helpful plant (through sensors in their feet), and lay their eggs. All three of these butterflies have elongated upper wings, hence the common name of longwing. The caterpillars are different colors, but each species has wicked-looking spines in rows along their bodies. They are for looks, though; the spines are harmless. The Julia butterfly is often a bright orange on top, but can also range to a soft ochre color. One year it seemed to be the summer of the Julia butterfly – there were Julias everywhere. Other times they seem scarce and are hard to find. They fly quickly, often zigzagging all over the place. The Zebra Longwing is the Florida state butterfly. 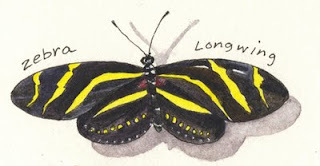 Its easy to identify, with its long black wings with yellow stripes and spots. Zebras like to fly more slowly, almost lazily. They also have an interesting bedtime habit – at night they fold their wings and roost communally on a branch or tree. One year a small community chose a nearby firebush as their night roosting spot, and I could get quite close to them at dusk. What an experience to creep up on thirty or forty butterflies all hanging down from a dead branch! 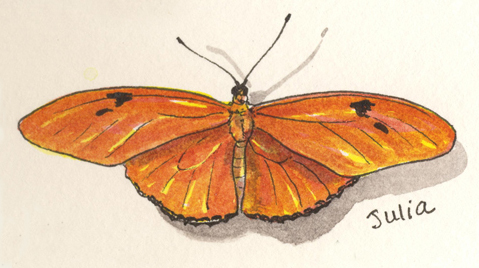 I've sketched the Gulf Fritillary before in this journal. They've been plentiful the last two summers, even though the butterflies in general seem to be fewer in number. This butterfly is bright orange with black markings on top, but oh so different below. Underneath, the wings are spotted with patches of silvery iridescence. Where Zebras prefer more shade, these butterflies seem to enjoy open sunny areas with a bit of cover. Thanks for visiting! You can read a bit more about these butterflies at the links below. Please click here for a free down-loadable PDF coloring page of these butterflies. I am in Central Florida, Gainesville and I too have found lots of butterflies and caterpillars on passionvine. I currently have Julia cterpillars on my passion flower incarnata. 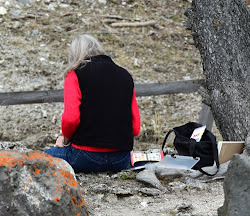 I love your journal. Thanks for posting! It is always a treat to see these beauties when we travel South. 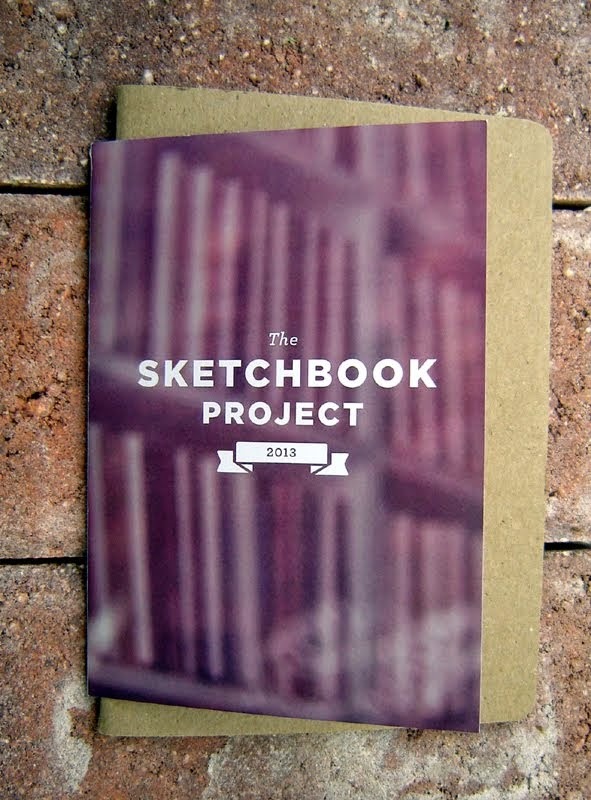 Great sketch. Hi Mindy, thank you for your kind words! In my opinion, you are the butterfly queen! I love your work!! My passionvines are still uneaten, so I'll be looking for tiny caterpillars soon. The last batches seemed to be mostly Gulf Fritillary, but I'm hoping for all three this go around. I need to get a p. incarnata for variety,plus for those gorgeous flowers. Thank you Ruca! I enjoy your adventures too! Thanks, Lisa. I sometimes forget than these are southern butterflies, though some migrate northwards a bit. I think the GF goes the furthest north, but not too far! Pam - thank you! I really enjoyed painting them. I wanted to show them sort of specimen-like, but without the unnatural wing positions that you see in guide books. I wish I had more time to show the open flowers and the fruit, but that can be for a future post! Lovely paintings and such nice information! Living in Kansas you wouldn't expect that I've seen these , but I have seen 2 of them at a Butterfly house I visited...I find the long wings very unusual and don't recall ever seeing that type of wing wild around here. Wow, Elizabeth...just beautiful! I really love how you put this page together, from the subject to the lettering it's all gorgeous. Very interesting post. I love butterflies and enjoy seeing them visiting my red pentas in the front yard. How amazing to have been able to see the Zebras roosting! Thanks, Kelly, it was a page I really enjoyed doing, and just wanted to do something a little different!